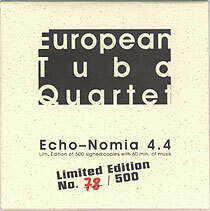 Larry Fishkind, tuba; Melvyn Poore, tuba; Carl Ludwig Hübsch, tuba; Pinguin Moschner, tuba. Recorded on 28/29 November 2002 at Audiolab Tonstudio. Produced in a limited edition of 500 signed copies.